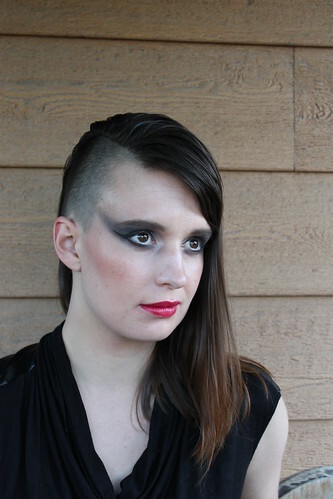 I had my make up trial this week. I found Amber Sheikh through a local photographer's website where I saw some really cool work she did on a punk themed shoot. She's fantastic and I'm really glad we decided to go with her. I love it when our vendors seem almost as excited about our wedding as we are! The make up is going to be really dramatic! I don't wear make up on a daily basis, so this is quite a change from my normal appearance, but I think it's going to look amazing with the dress and all the post-apocalyptic decor. 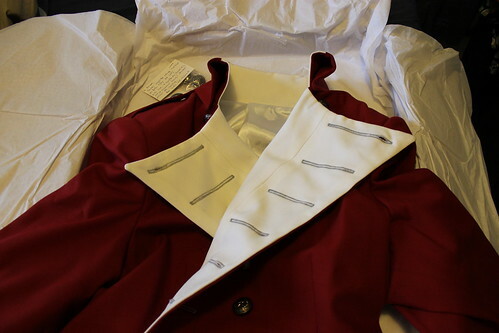 In other news, Chris' tailcoat arrived. I can't wait to show you pictures of Chris wearing it, he looks incredible. It fits perfectly and makes him look ready to lead an army into battle. While we've been working on a few projects, we haven't made much progress on decorations lately. But we had friends over last night to help us out and more coming by tomorrow, so I think we'll be checking things off our list soon. We did put together a pin board to help our guests visualize what they might want to wear to our wedding. We're getting a lot of questions about the dress code and Chris and I tend to forget that not everyone has a closet full of costumes like we do. You ARE so lucky that everyone is excited, but it could only be expected :) Hair & makeup are looking amazing!! !